Legoland Hotel opened its doors to public in 2013. It has almost been a year since its opening that we decided to make a trip there. It is an open fact that the family are Legoland fans. We had reviewed Legoland, gave an A to Z guide and took a splash at Legoland Water Park. So naturally when told of this holidays, the boys were giddy with delight. Since it was the school holidays, it was the perfect excuse to indulge in a comfortable 3 days 2 nights stay at Legoland Hotel. Before we start our review, we want to clearly state, this is a hotel build with Kids first in mind. So if you are planning a romantic getaway with your love one, you might just like to look elsewhere. If you are looking for a perfect getaway for kids,especially boys, this might be it! Getting to Legoland was a breeze . On a non busy day, you would probably make it to the hotel in less than an hour from anywhere in Singapore. Take the Tuas checkpoint to JB, past the custom and look for exit 312. Thereafter there will be signs to lead you to the hotel. Do note access to the hotel is via a slip road separated from the park and it is located before you reach Medini mall. Before we step into the hotel, the boys were already going Ohhhss and Ahhs. It is not hard to understand why since we were literally swamp by Lego bricks at every corner of the hotel. Checking in time for Legoland Hotel is at 4 pm. Before you scream 'why so late! ', there are plenty of things to entertain the little ones before check in. You could always opt to visit Legoland if you arrive early. We took the 2 days pass which was offered at a special discount for hotel guests. Book online and you get the 2 days pass for a 1 day pass price. The best part is that this combo tickets allows you unlimited entries to both Legoland and Legoland Water Park on the same day. We do suggest an early check in first to get your park tickets and get your hotel keys later. While checking in, you might like to look closer at the walls. 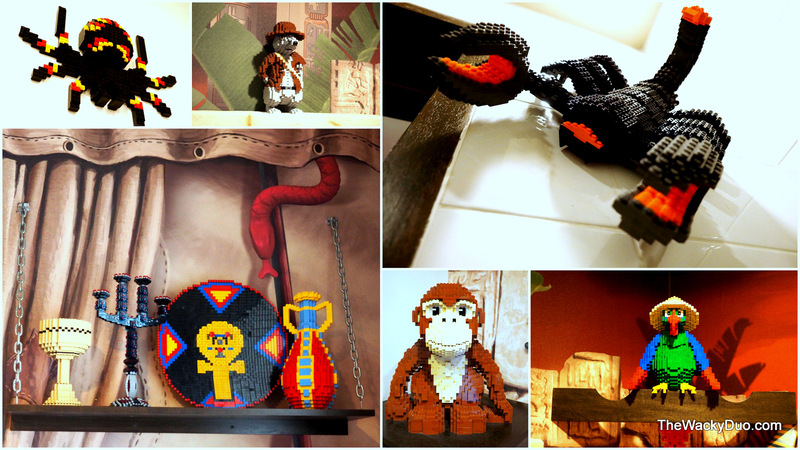 There are hundreds if not thousands of minifigures on the wall for a Lego fan to go gaga over. Check out time is at 10 am. You can request for late checkout till 12pm subjected to avalaibility. 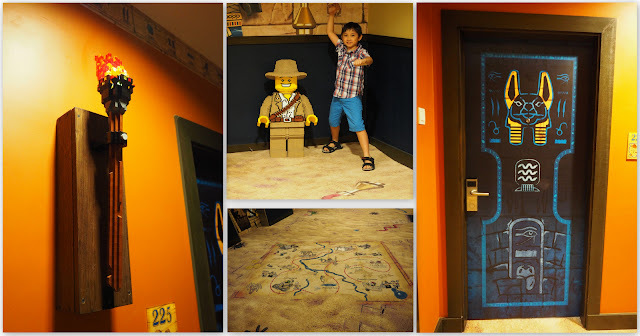 With a late check in and an early check out, one day stay in Legoland is never enough! You can place your bags with the hotel and claim them when you check in. That way you need not lug your bags around the park. Can I hold your bags? As we proceeded to the rooms after key collection, the magic happened. This was the first time we encountered a Disco lift and it was an uplifting moment. Imagine doing the boogie in the lift. I am sure we were not the only family jiving to the beat as the lift bought us to our designated rooms. There is a choice of three theme rooms of various sizes and comfort to choose from. Take your pick from standard , premium , deluxe / suite. Our room of choice for this vacation would be the Adventure premium room. Let go on an adventure. Our adventure started the moment we reach our floor. 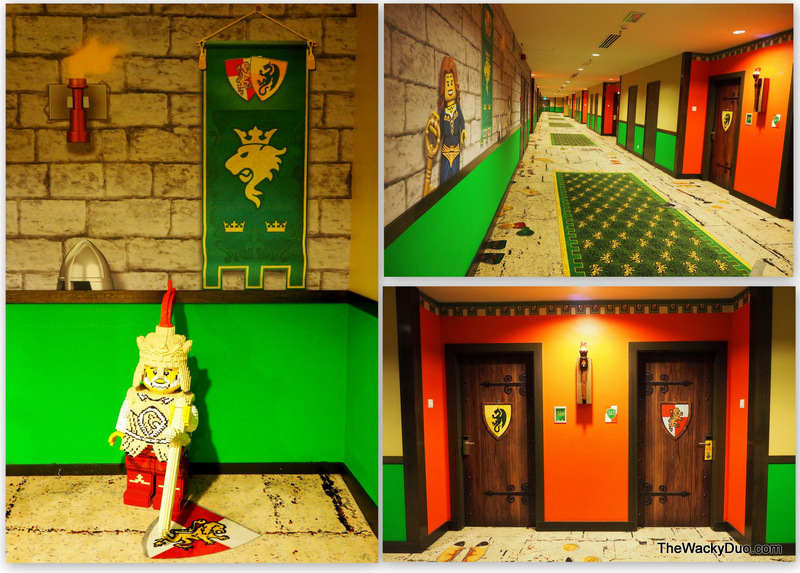 Here you will be greeted by a well decorated hallway with LEGO adventure theme walls! floors and figures. Step into the room and you will be greeted by a bunk bed that sleeps 3 comfortably. We love the Egyptian mummies touch in the room. Very Indiana Jones. The bunk beds area is meant for the little ones. There is also a Tv meant for their entertainment needs. It was no surprise that the boys insisted on being tuck into bed, even though it is only 5pm. Nightlights are avaliable by the side for the little ones. For the adults, there is a generous king size bed located in another room. The rooms are separated by a sliding door, giving some privacy to the children. We were glad that adults are given their own TV as well. In most hotels, with only 1 TV, the parents usually will be watching children show throughout the stay. As much as I like Cartoon Network, another minute of that during the holiday can be a pain. Thankfully there was HBO for me to indulge for this trip. Wifi was supposed to be provided. We had the signals in the room but we could not log in with our iPads during the stay. Do request for a room with a view of the park. The other options may not be as nice. The boys loved the room. It helped too especially when they are given a mission to unlock the treasure box from the clues provided. Unlock the box and you will be rewarded with LEGO merchandise. We had the keychain, the magnet and a Legoland notebook. If will be a shame if you come to Legoland without playing LEGO. The hotel took care of that by providing a Duplo set for the little ones LEGO fix. The room also came with a safe fixed on an open wardrobe. There were coffee, tea and mineral water provided free for own use. The Lego theme is found in the toilet too! 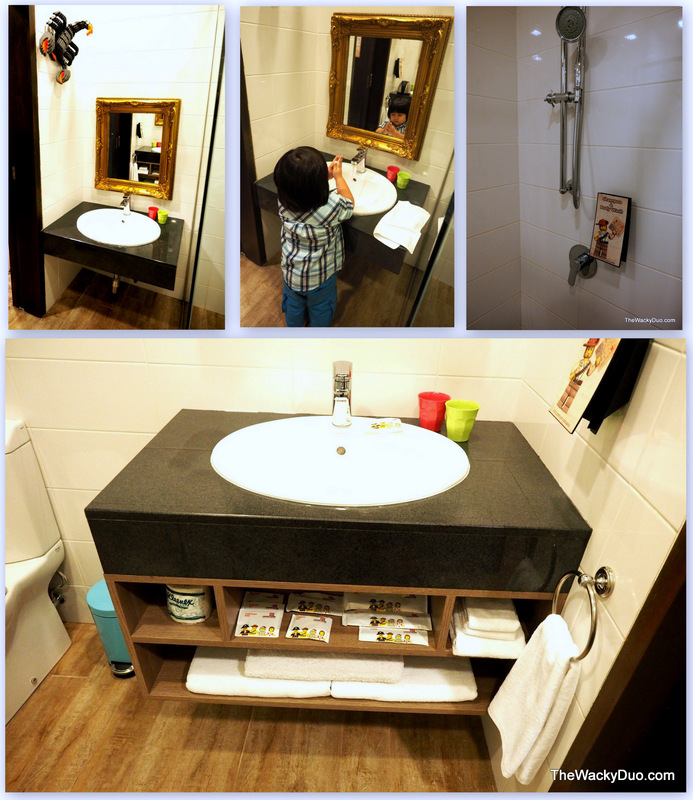 The toilet comes with a shower, an adult basin and a kid size basin. Lego toiletries are provided too. 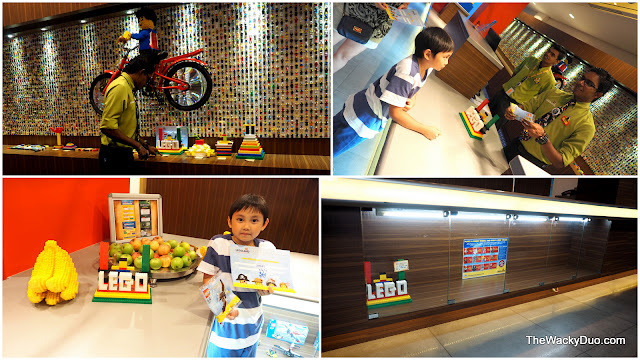 We loved how LEGO bricks is used to decorate the room. You could even play a game with your child to see how many Lego creations you can spot in the room. We are sure there will be another trip in the near future. 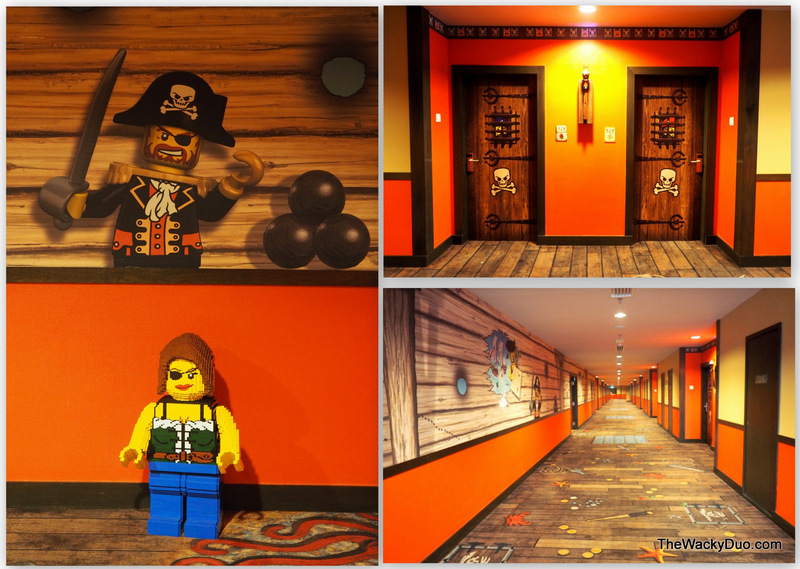 Already the Wackies are eyeing the Pirate Theme room for the next trip! From what we observed LEGOLAND hotel is generally targeted at boys. LEGO has a Friends series targeted at girls , but unfortunately no Friends theme rooms for the moment. Nonetheless we are almost certain the hotel will appeal to most kids regardless of gender. It was not easy to pry the boys away from the room, but when we finally managed to do so to explore the rest of the hotel, there was not a word of complain. Not especially when they saw the Lego Castle and the Pirate Ship. There are 2 Lego play pits located in the lobby. Filled with Legobricks, children are encouraged to build their own creation. The pits are located at the huge Castle and Pirate Lego Sculptures. 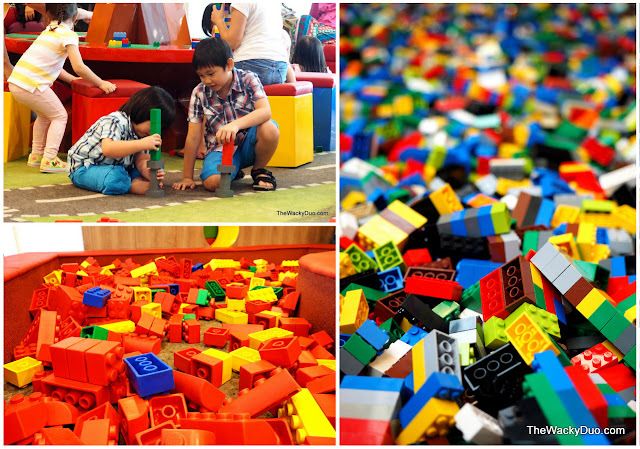 For the younger ones, there are soft padded Lego bricks pits located nearer to the Bricks restuarant. From what we see and experience, the kids play area is a hit amongst the kids. The boys wasted no time in building their own light sabers for a duel. Tucked away in the corner is a xbox play area for added pleasure. For the adults, you can choose to have a massage at the relax station for RM5. If you want to pick a Lego set while you wait, there is a shop at the lobby. The selection however is not as extensive as The Big Shop @ Legoland. Breakfast is provided and served buffet style at the Bricks family restaurant. 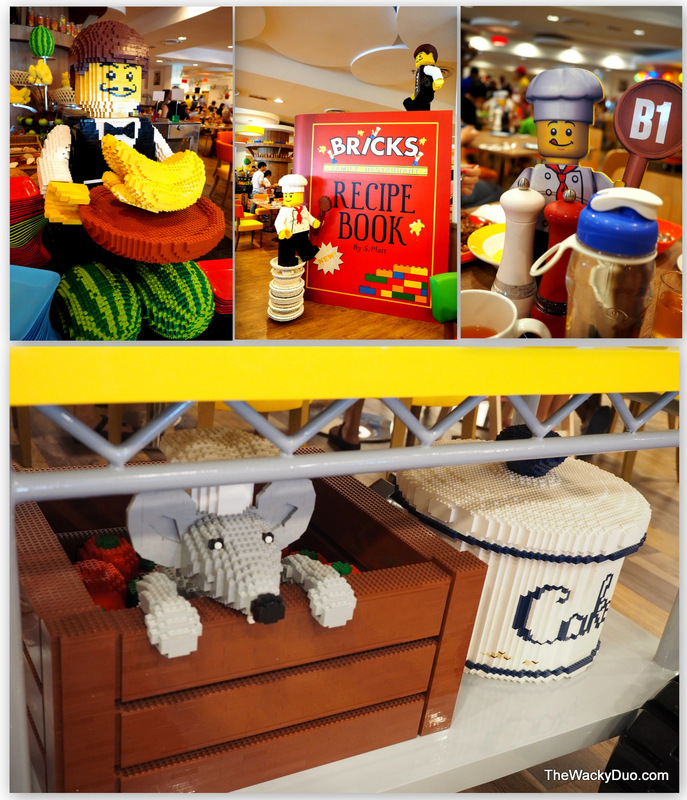 For those who wants to dine in LEGO Style, Gourmet Bricks is an option for dinner. For parents who need a drink or two to unwind at the end of he day, Skyline bar is open. It is located within the Bricks Restaurant. Food at the restaurants are a tad pricey. An alternative to food options can be found at Medini Mall located next to Legoland restaurant. It is an easy and relatively safe 5 minutes walk from the Hotel. For those who are skipping Legoland Waterpark, there is the option of a swimming pool at Legoland Hotel. Actually there are 2 pools. An adult pool measuring 1.2 m deep and a child friendly option measuring 0.6 m deep. There are a whole host of activities around the hotel during our stay. For updated list of activities, we suggest you check out the information board at the lobby. Don't miss the Meet and Greet. You just might just bump into the mascot of Legoland while you are there. We participated in the daily build a Lego challenge and won the challenge with a customised LEGO Lightsaber birthday cake. You can check our creation out at the reception display during September.Yippee. There are different themes for the challenge every month, do check out the theme for the month for this challenge. 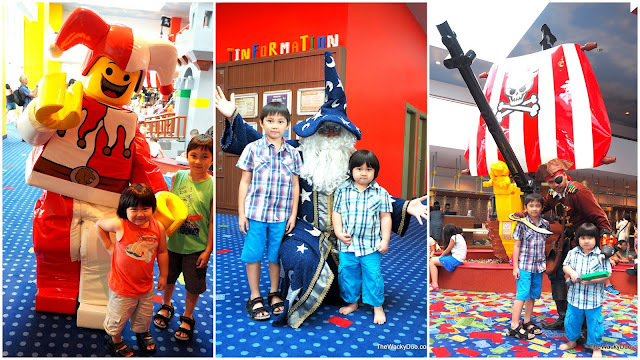 Other activities you can participate includes colouring activities, song performances and even Lego minifigure swaps with the Staff of Legoland Hotel. Lego has come a long way since it was first created in 1932. We are glad that it has come so close to home. A stay in Legoland Hotel is never complete without a visit to Legoland. So do include that in your agenda for the trip. It was an enjoyable stay for the kids. So much so that I have already 'requests' for a trip back this coming December holidays! To book a visit to Legoland, head to Klook for a 20 % off normal rates. Hi. Thanks for all the details! I love your website! Very informative! Especially for parents with children like myself! I'm just wondering for the bunk beds, their bed size is for children only? Can adults sleep on it too? Is it like a single bed or super single bed size? Thanks! Safe to park in the hotel carpark? any security guard patrolling?